During this year’s wader breeding season, BirdWatch Ireland staff were assisted by a fantastic group of volunteers in their work maintaining the predator proof fence on Inishee Island. Inishee is one of the most important breeding sites for waders in the Shannon Callows. Each year, Lapwing, Redshank, Snipe and Curlew return from their wintering-grounds to breed on Inishee. The predator-proof fence, erected in 2009, with funding from the Heritage Council and the National Parks and Wildlife service, has been hugely successful in preventing ground-predators such as mink, otters and foxes from accessing the island. As a result, wader populations on Inishee have steadily increased since 2009. 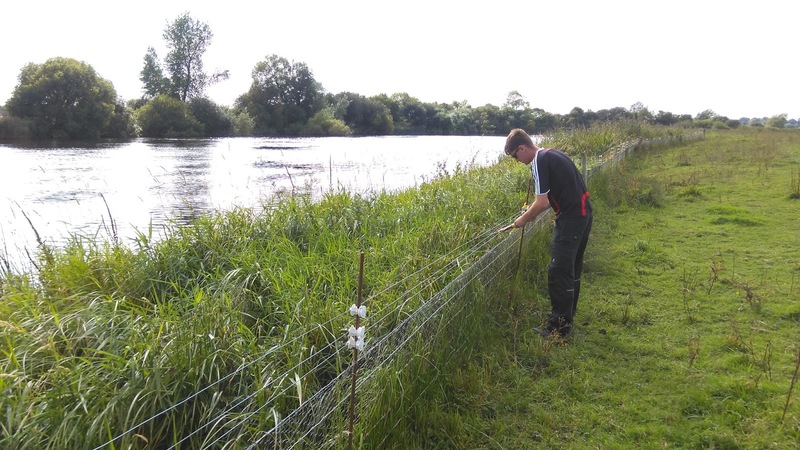 To ensure the successful operation of the predator-proof fence, and thus the protection of the breeding waders present, the fence must be monitored and maintained throughout the breeding season. BirdWatch Ireland have undertaken this work annually since 2009 and did so again in 2016 with funding from the Heritage Council. A vigilant Redshank, keeping watch from a fence post. Once the winter floods had receded and the island (including the fence!) emerged once more from the Shannon, work could commence. In early May, a team of six valiant volunteers worked alongside BirdWatch Ireland staff, repairing damage caused by the heavy winter flood and preparing the fence for the up-coming breeding season. Across a five-day period, the team worked on their hands and knees, literally, around the 4km long fence to get it back in action: gaps had to be closed, wires checked, holes patched, and vegetation and debris removed. In the presence of prospecting birds, the team did a fantastic job and in great spirits. Furthermore, the team gained some invaluable experience in conservation management and an excellent insight into the breeding ecology of waders. Vegetation control is essential to maintain the current in the fence. Thanks to the hard work of the volunteers, the fence remained intact and live during the entire breeding wader season, and the breeding waders of Inishee - Redshank, Lapwing, Snipe and Curlew - breed successfully! It is a privilege to observe any of these species during the breeding season, with fantastic flight displays and beautiful calls aplenty. However, it was particularly special to see Curlew successfully raise young on the island! Unfortunately, Curlew have declined to dangerously low levels as a breeding species in Ireland and face immense challenges trying to successfully raise young. Again, the predator-proof fence of Inishee has proved its worth by protecting our vulnerable waders from ground-nesting predators. Inishee also provided a superb classroom in which to teach local farmers about breeding wader ecology and how to manage land for the benefit for breeding waders. 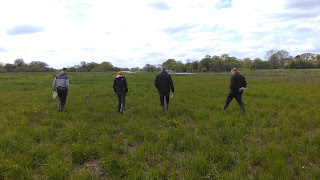 These farmers are participating in the trial of a new results-based agri-environment payment scheme (RBAPS) for breeding waders in the Shannon Callows - for more see https://rbaps.eu/. Inishee provided invaluable, practical experience of what exactly waders require to breed successfully, as well as how one can best manage their land for the benefit. Again, BirdWatch Ireland would like to extend their gratitude to the dedicated and hard-working team of volunteers from 2016 and to the Heritage Council for funding the project. BirdWatch Ireland staff and local farmers discussing breeding wader ecology and how to manage land for the benefit of breeding waders.